I’ve recently finished making a group of wedding couples (see photo at the end of post) for the new edition of Felt Wee Folk (2015 pub date). While I was working on them, I imagined that the dolls would be photographed on a cake, lined up on tiered layers. As a prop, the cake didn’t have to be real, but I wanted it to look realistic. My friend Terry McKee provided technical assistance and moral support as we spent 2 afternoons in my kitchen working the problem. 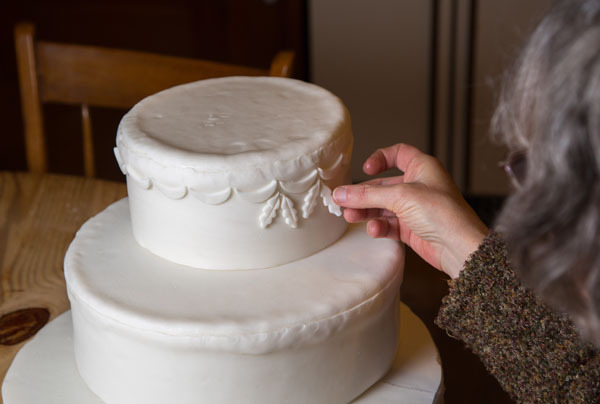 A few years ago, we made a real wedding cake, which you can see here. 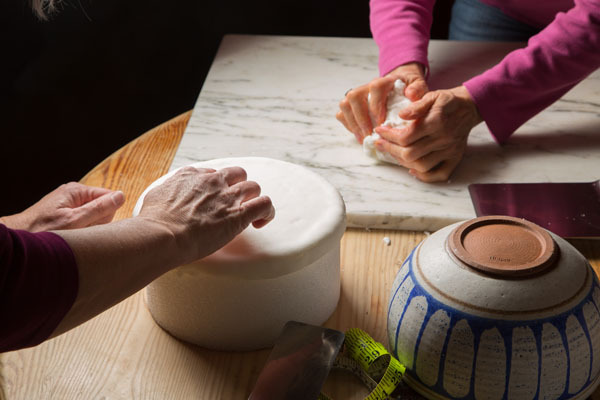 We quickly found out that the sharp edges of the styrofoam cake forms tear through the fondant, so we changed our approach. 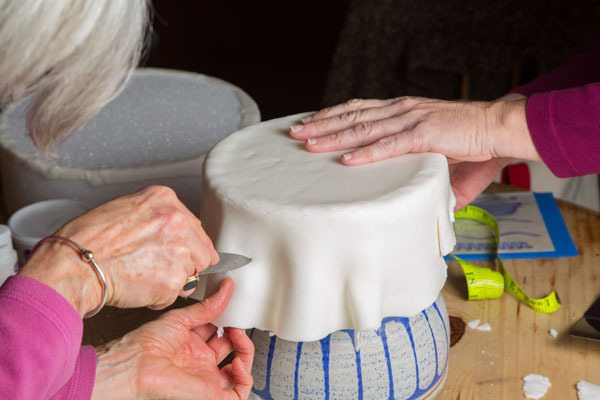 We padded the sharp edge with fondant and abandoned the by-the-book instructions that called for draping the cake over the top and sides with one piece of fondant. We decided that a top and collar would work better, since we would be able to cover any seams with frosting later. 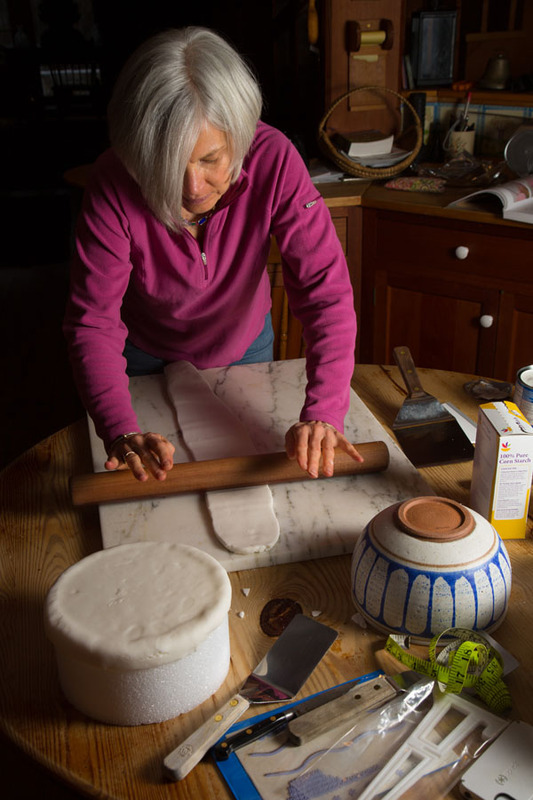 Here’s Terry rolling out the fondant collar. It took most of the afternoon to cover both tiers and the base. I lined up the dolls to see if they would all fit. After Terry went home, I spent the rest of the afternoon decorating the cake with pieces of fondant that I cut out with leaf and moon shaped cookie cutters. 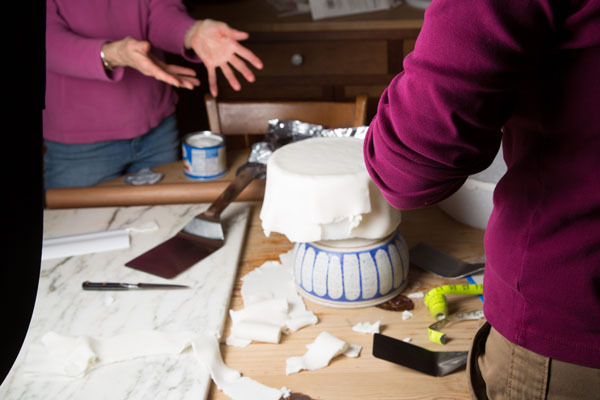 On day 2 we resumed work on the cake. 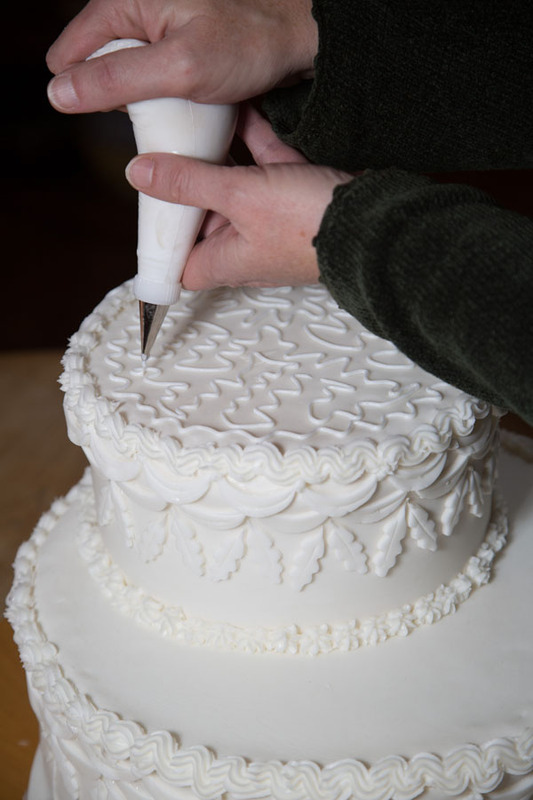 Terry put her piping skills to work as she applied frosting around the edges. 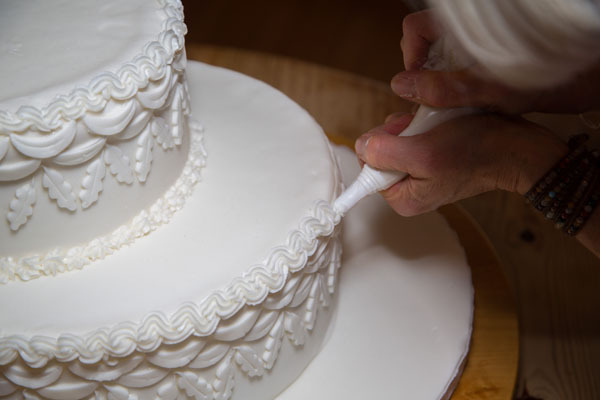 I piped out some squiggles on top and voila, a wedding cake! Terry was a big help and it’s always more fun to work together as we tackle these new and unfamiliar projects. The cake should last a bit, being just sugar and styrofoam. I’m not sure how long I’ll keep it after we photograph the scene. 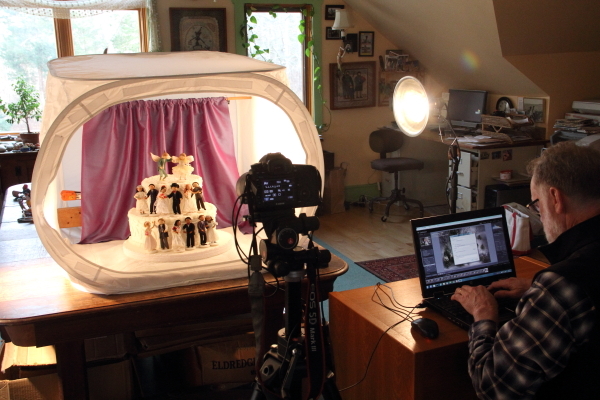 Rob and I set up the cake in the light box, with a silk curtain behind and took photographs for the book. Sorry about the teaser, but this is as much as I can show of the dolls. I still have a lot to do for the book, but I can feel it getting closer! This entry was posted in 2nd edition, Felt Wee Folk, Photography, Salley & Terry production by Salley Mavor. Bookmark the permalink. Wow! Looks amazing! What a talent you have! Fantastic! Oh how Magical! You must have had fun..although a bit of thinking went on too..I find nutting out problems quite fun though.bet you do too.Lovely to do this with a friend. can’t wait to see the new book. I am so excited for the new book Salley, I can hardly wait. Love your work, thank you for your teasers, they are so much fun! Thank you for sharing your processes. And I cannot wait until the new book is here. and love having these little insights on how it all happens. I can’t wait for this book to come out! The sneak peeks are wonderful. Makes me want to get out the first edition and make some dolls. 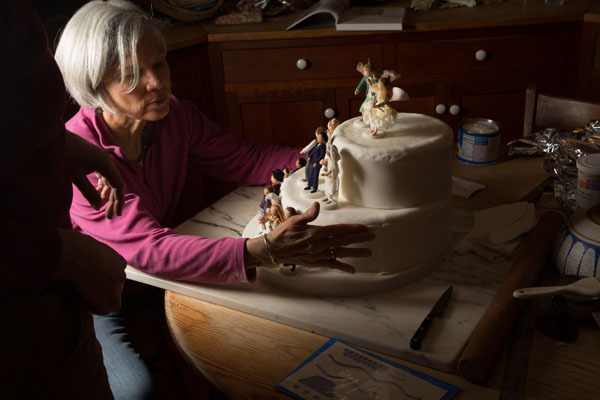 What artistry …………..Sally and Terry………..perfection ………..
What a beautiful cake! Can’t wait to get a closer look at the figures. Oh, Salley, I love when you talk about your work and explain what you are thinking when you design! Your ladies are wonderful and I enjoy seeing them in action. 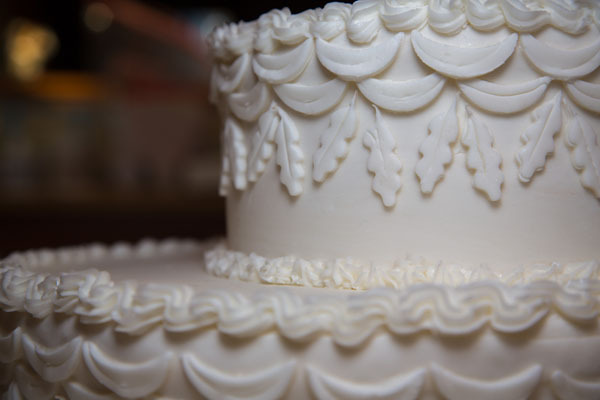 The cake has turned out beautifully, and I can’t wait to see the brides and grooms! I am so happy at the joy you must be having in doing this work!!! !